A modern holiday experience awaits at Holiday Inn Express Bangkok Siam, a short 2-minute walk from National Stadium BTS Skytrain Station. Only 200 metres from MBK Shopping Centre, it has a rooftop 24-hour fitness centre and elegant rooms with free WiFi throughout the property. Fitted with soft carpeted flooring, all rooms feature a 32-inch flat-screen TV. A refrigerator and an ergonomic work desk are included. 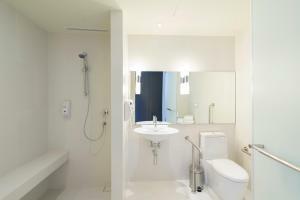 En suite bathrooms are equipped with massage jet showers. Guests can arrange day trips and car rentals at the tour desk. 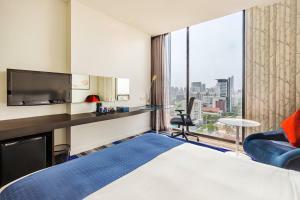 The hotel also provides a business centre, a self-service laundry facility and free parking. Great Room restaurant on the 7th floor serves international dishes. It features an Express Start Buffet Breakfast with Grab & Go options. Vending machines are also available there. 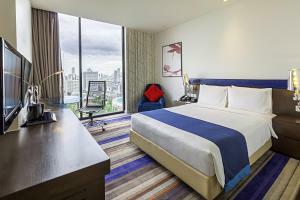 Holiday Inn Express Bangkok Siam is a 5-minute walk from Jim Thomson House and is a few minutes walking distance from mega shopping malls, including Siam Paragon, Siam Discovery, Central world and Platinum Fashion Mall. Guests have easy access to several major attractions such as The Grand Palace, Wat Pho (Reclining Buddha), Wat Pra Keaw (Emerald Buddha) and Erawan Shrine. Room offers air conditioning, a flat-screen TV and an en suite bathroom. Please note that bedding requests are subject to availability upon check in. Non-smoking room offers air conditioning, a flat-screen TV and an en suite bathroom. Rate: THB 2429.98 ... THB 5923.05; select dates below to get current rates. Offers air conditioning, a flat-screen TV and an en suite bathroom. 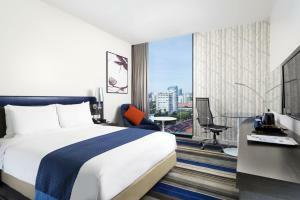 Rate: THB 2259.84 ... THB 6590.02; select dates below to get current rates. Wheelchair accessible room offers air conditioning, a seating area and an en suite bathroom. Rate: THB 2447.10 ... THB 5836.74; select dates below to get current rates.